When I was in high school, being in the band was one of the highlights. There weren't many. I probably had a typical high school career. I wasn't popular (though I was fortunate to be in classes with the most popular students). I didn't play any sports. I was an above average student and graduated in the top 5% of my class, but I wasn't necessarily accomplished in any particular subject. I was just a tall, skinny, introverted kid who preferred to stay off the radar, out of the limelight, with a small circle of close friends much like myself. But I thrived in the band. That was what I enjoyed more than anything else. I started playing the clarinet in 6th grade, and had worked my way to section leader in our Symphonic Band by my senior year at Frederick Douglass High. I added an alto saxophone to my repertoire during my junior year, and joined the school's jazz band. That was really the highlight of my senior year. The jazz band was a diverse group of musicians. Wakene played alto and tenor sax. He was outgoing and had no qualms about playing a solo on many of the songs we played. Randy played the bass, and while he always seemed to be missing a string on his bass guitar, he gave our sound a touch of funk. Andre was a talented all-around musician. Trumpet was his main instrument, but he also played keyboards, and he was a percussionist in the symphonic band. Dominic was our drummer, however he was just beginning to play and was very raw. He was fine playing a straight 4/4 rock beat, but was still learning how to play anything else. Finally, we had a trio of guitar players. Joe was still learning to play the guitar, and with a background in hard rock and metal, his style tended to lean towards the gruff and grungy distorted sound. Giles had more of a blues style, and he gave us more of a rhythm guitar sound. Kirk was the true talent of our band. I'd known him for years, and he played a variety of instruments, including clarinet, sax, piano, contra-bass clarinet, and even the French horn. While the guitar was a new instrument for him, he had learned to play it fluently, and he became the lead soloist of the band. Our band director, Mr. Lopez, was a professional jazz drummer, and that benefited Dominic more than anyone. In addition, he could substitute for Dom on the more difficult songs, which helped everyone by giving us a steady beat as we learned to play with each other, since none of us had ever played in the jazz band before. We learned several jazz pieces, including a few classics, like Herbie Hancock's "Chameleon" and Miles Davis' "Freddy The Freeloader." We also brought our own visions to the band by writing our own songs, usually with one of the group bringing a melody or bass line as the starting point, and the rest of us collaborating on developing an arrangement. "New Groove" was a hot mess, but it was fun and showed our creativity, but our true accomplishment was a song we dubbed "Arabian Sunset," which Kirk brought to us. Kirk had developed the melody while working on an obscure chromatic scale, and the rest of us filled in to turn it into a full masterpiece, which became our signature song. In fact, to add to the melody, I used my clarinet instead of the sax to give it more uniqueness, and I even played a few solos on it, which brought me out of my music shell. By the time the winter rolled around, we were pretty solid, and it was fun to perform in front of a variety of audiences. We went on the road and played at my old middle school, which was a lot of fun, with an enthusiastic audience. 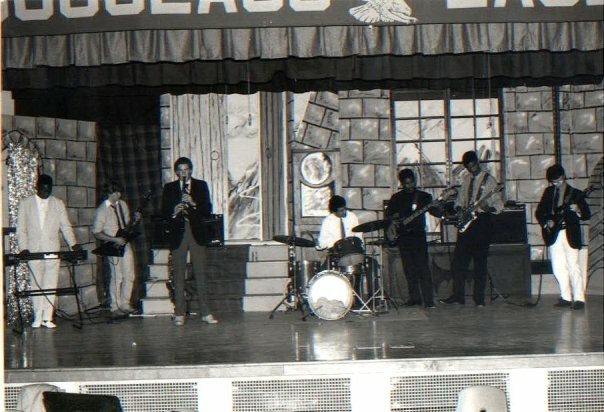 We performed for a Black History month assembly at Douglass, and as our reputation grew, it really didn't seem to matter what we played. The audience was anticipating something exciting and different, and we delivered at least on the different part. As a not very popular, introverted student who preferred not to draw attention to himself, this was alien territory for me, and I didn't necessarily take to it naturally. But it was fun, and, along with the more classic training I received in Symphonic Band, the Jazz Band only enhanced my musical abilities and education. Music and the arts are so important to our students, and opportunities for this part of their education in public schools should never be questioned. Please support this aspect of public education for our students.